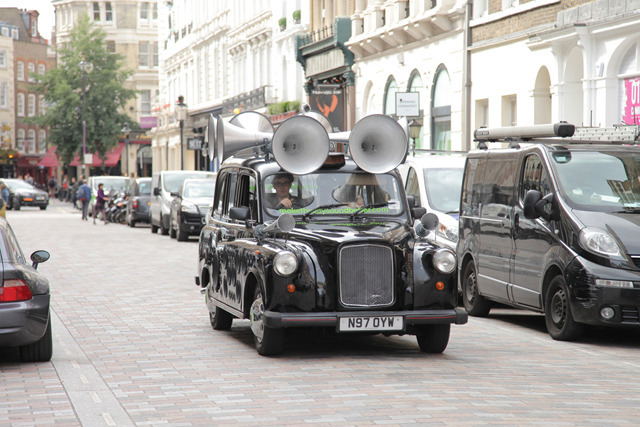 The Sound Taxi is equipped with a microphone that records its surrounding noise: the rumbling traffic, screeching brakes, sirens, construction work all are a part of the everyday din of the city. A specially designed software written in Max analyses the frequencies of these noises and uses them to generate unique music in real time. The spectrum is split into 25 frequency bands, like a graphic EQ, these bands are used to control different types of sounds in Ableton Live. For example a low rumble starts a bass line or loud hiss would trigger some hi hats, with the loudness of the noise controlling the loudness of the music. 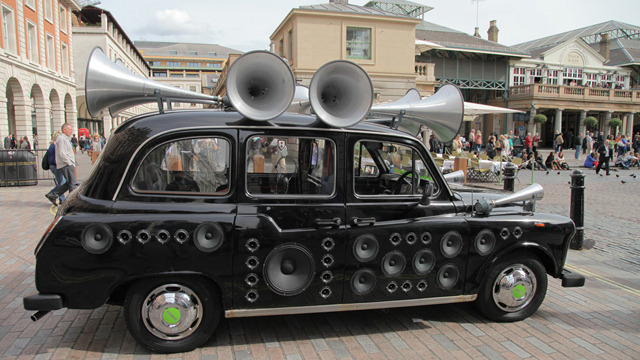 The music generated matches the dynamics of the street, the sounds will change and evolve as you drive in different parts of the city.